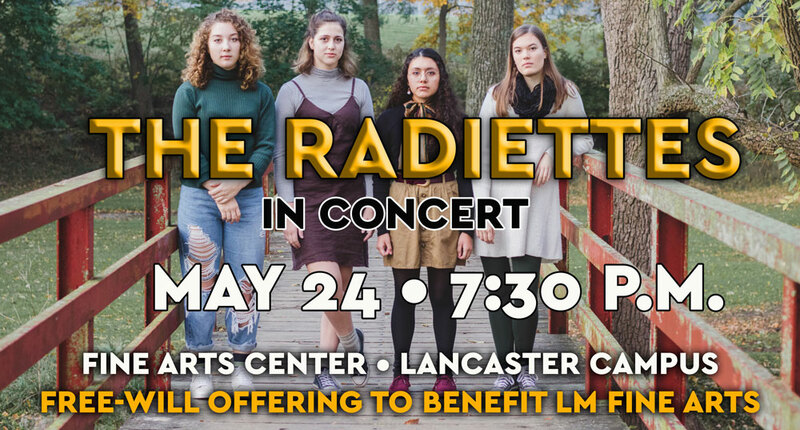 The Radiettes, an indie/folk band composed of Lancaster Mennonite High School seniors, take to the stage by popular demand to perform a full-blown concert May 24 at 7:30 p.m. in the school’s Fine Arts Center. Admission is free; a free-will offering will be taken to benefit the school’s Fine Arts Endowment. The Radiettes band is composed of Sydney Esch, Bethany Bronkema, Kate Kindelberger and Mica Nieves whose style was decribed as a “fresh, non-traditional approach to creating music” in a recent LNP article. The Radiettes will perform covers from modern folk acts plus original songs featured on the group’s first album, which will be released for the first time at the concert. “Radium Girls” exposed the Radiettes to a larger audience, leading to gigs at local coffee shops, churches and music events. “I think it’s a combination of us wanting to really stretch ourselves as musicians in both technical skills and creativity, which is really what drew us to doing “Radium Girls” and is what is drawing us to writing our own music now,” Esch said. The Radiettes tend to use traditional acoustic folk instruments to provide minimalistic accompaniment to their vocal harmonies, often trading instruments such as upright bass, guitar, mandolin, banjo and ukulele. Vocals are also mixed and matched in various combinations. For this special benefit concert, the Radiettes will be joined by fellow LM alumna Mackenzie Paige, a Lancaster-based folk singer/writer. On May 19, 2017, Mackenzie Paige performed in a CD release concert for her latest album, titled “Piece of Art”. All proceeds from the concert were donated to the Lancaster Mennonite School’s Fine Arts Department. “Piece of Art” can be purchased on iTunes, as a digital download or via Paypal as a disc. The Radiettes will be using this opportunity to release their own CD, which will be available for the first time at this concert. They are currently seeking funds to cover the production costs through a Go Fund Me page.